Did you know a recent survey by Dun & Bradstreet showed 54% of B2B Marketers are currently buying advertising programmatically. Furthermore, 62% of marketers cite their ability to layer insights and data as the biggest advantages of buying media programmatically. Programmatic advertising is drastically changing the B2B advertising world. It is quickly helping to reshape how marketers are running ad campaigns and improving productivity in the process. 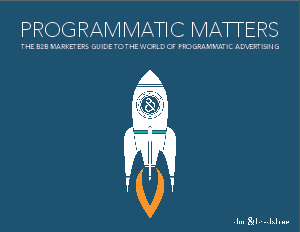 Download this eBook to find out everything you need to know about programmatic ad buying, why it is reshaping the advertising world and why it is a must have when you are planning your next big ad campaign.